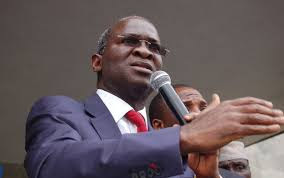 The Minister of Power, Works & Housing, Babatunde Raji Fashola, has explained that the appointment of Usman Gur Mohammed, who is on secondment from the Africa Development Bank (AFDB), as the new interim Managing Director/ Chief Executive Officer of the Transmission Company of Nigeria (TCN) was born out of the need to take the Company to a higher level of operational effectiveness and perform its functions optimally. The Minister made this known when he appeared before the National Assembly Joint Committee on Power, Steel Development and Metallurgy which came on the heels of petitions written to the Senate by Staff of TCN, under the umbrella of the National Association of Electricity and Allied Companies asking the Senate to intervene. Answering questions from the Senate, the Minister stated that the appointment of Mohammed had nothing to do with the AFDB’s loan to Nigeria to help reform the power sector, pointing out that the appointment was not a criterion for the loan, but was based on the expertise the new MD would bring on board. The appointment of the interim MD for TCN was designed to ensure responsiveness to the needs of DISCOs and GENCOs, and to improve their efficiency. The Minister further allayed fears of dampening staff’s morale, saying that this should not be joined to the issue of the appointment, adding that the President had used his prerogative to appoint whomever he chose to manage the affairs of TCN. Chairmen of the two Committees, had earlier stated that the National Assemble was not interested in dictating to the Minister on how to run his Ministry, but that they just wanted to ensure that the rule of law is followed at all times, for the sake of accountability and transparency in government business.